Destiny Review: Destined For Greatness? Destiny is finally here. I waited in line at the midnight release event and I enjoyed minimal hours of sleep throughout the week to make more time for playing. I spent a lot of time with the Destiny Beta on PS4 and that only added to my anticipation. Since the launch of the full game I have spent more hours than I care to admit playing while trying to decide if Bungie has delivered on all that they promised throughout the year of hype. I think, for the most part, that they have created something worth playing and worth spending time with. This is a First Person Shooter (FPS) for every lover of the genre, as well as, newcomers to the genre. Destiny's Story is entertaining, the Crucible is frantic, Strikes can quickly become insanity, Patrolling is pure laid back exploration fun, and the End-game content is where the game really takes off; there is something for everyone. Bungie is building the world of Destiny to continue on for ten years and the story shows this. The overall narrative is intriguing, but I felt that I finished with the same amount of questions that I began the game with. The questions were different, but this is indicative that Bungie wants to keep me coming back for more story over the next decade; I am okay with this. 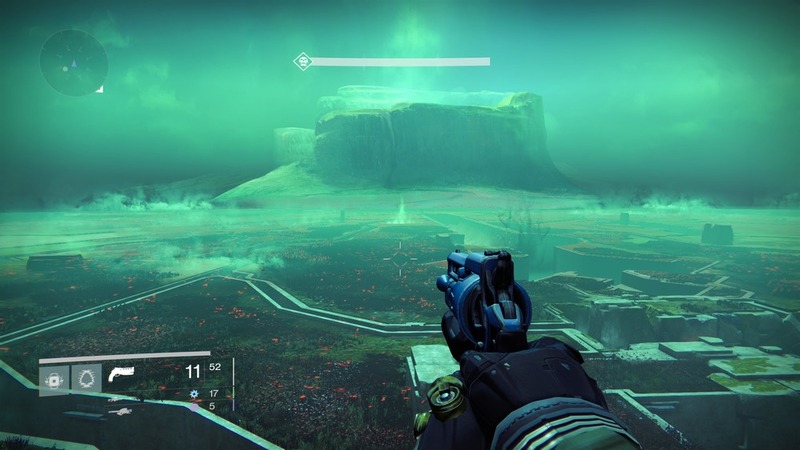 Destiny is beautiful and the story is interesting. I played through the entire campaign with a friend and the experience was exceptional from a co-operative stand point. Also, the experience is just as seamless with three people. I never had issues with sharing missions or completing objectives and the emphasis on teamwork is rewarding. The missions, when set to the Normal mode of difficulty, are the right level of challenge for a solo player, but once you add a second player the difficulty needs to be ramped up. Luckily, this is possible. All the missions can be played on varying degrees of difficulty and I highly recommend playing the game on Hard if you are not fighting solo. The challenge on Hard is just that, a challenge. For playing on higher levels of difficulty more experience is awarded and the chance for better gear rewards increase as the level of difficulty rises. There is a difficulty for players of all levels of skill. The overall campaign is not very long; there are a few twists and the voice acting is brilliant throughout, but the mission design is the standard fare of FPS missions. Go here. Kill this or that. Fight off waves while your Ghost hacks into something. Fight enemies on way to next objective. Fight boss of level. Back to the Tower. However, the redundancy of mission design does not usurp the fun of the game. The gun-play, environments, and enemies are all great and many times I found myself just looking around and taking in the sights right before I hopped into another firefight. There are also Bounties to be picked up and completed while playing the story mode, patrol, or strikes. Some are very easy and some are challenging, but they all reward you with experience and Vanguard/Faction points.The enemies are not stupid, but they can become predictable. That being said, sometimes I would jump into a firefight without scoping out the situation and I would be punished by the enemies for my impatience. This only made me want to revive and come back with a vengeance. Whenever I tired from the story, or, the next mission was a higher level than my character (this only happened because I was playing through the game on Heroic) I would simply switch over to the Crucible to mix things up. The Crucible is fun and it never felt unbalanced or unfair if someone was a higher level then me. While in the Crucible I was still gaining experience, so, it is completely viable that I could reach level 20 without playing the story at all, but it would take awhile. I do not recommend that route. The Crucible offers a small variety of game modes: Control is a capture the flag type, Clash is a team death-match style, and Rumble is free for all. There are a two 3v3 modes that I tried out as well. One had my team of three Guardians trying to capture and hold down Relics while our Ghosts extracted information. This game mode was played on smaller maps and required teamwork to win. The other 3v3 mode is a Team Deathmatch style, but on a smaller scale and required teamwork and communication the same as the latter. When I had two friends to play with the 3v3 game modes were a lot of fun. At the end of each match players on each team are randomly awarded gear or Engrams to take back to the tower for decoding. These Engrams offer the chance for awesome gear, but there is no system to these drops and many times I would be in the top three of my team with no reward for my efforts while the people in last received rewards. This randomization can be a little annoying. Each person has the opportunity for two rewards at the end of a round, but I think that each person should get one reward, still randomized of course, with the second reward being the one not everyone will receive. Also, when my team lost it seemed that much less gear was rewarded. The gear as rewards really comes into play when I surpassed level 20 and finding new gear and weapons became my sole goal within the game, but I will touch on the End Game later in the review. The Crucible is not all about the gear. The Crucible is where I could show off my Guardian and it offered a break from fighting AI while still gaining experience and gear, so, it never felt like a waste of time. When I was sick of playing against real people, but I was still hunting for gear, I would jump into a Strike with a trio of Guardians. Strikes are found on each map and they offer a decent challenge. The difficulty of Strikes, like story missions, can be adjusted to fit the level of a Guardian, thus, offering more of a challenge and more rewards. Since I only had myself and one other person to play with matchmaking would find someone to fill out the team. I found it more fun when I had a team that consisted of two other people that I know. A few times the third person I picked up dropped out leaving just the two of us to complete the Strike, or, the person playing thought they could do a higher level Strike than their character could handle. This become crippling and sometimes made the Strike unbeatable, but this only happened a few times out of the many Strikes I completed. At level 18 I unlocked the Strike Playlist area on the map. This mode dropped us into a random strike with a higher level of difficulty; it was tough for my level 18 character. The Strike Playlists offer more experience, more challenge, and more gear than just doing the normal level Strikes and the term “playlist” means that once my team completed a Strike we were queued up for the next one. I leveled my Guardian and higher level strikes unlocked that offered even more rewards and more challenge. The highest level strike that is always available is level 24, but just yesterday I saw a level 26 and level 28 Strike with some insane difficulty modifiers like: enemies drop no ammo, enemies never flinch, enemies always rush, enemies all have shields, and things of that nature. These modifiers add increased difficulty to a Strike and made things more interesting, or, it made me want to hurl my controller across the room. There is also a weekly Heroic Strike that has the same increased difficulty modifiers, but instead of just one modifier, it had all of the modifiers mentioned – all at once. Insantiy. This variation gives a fresh feel to the Strikes and the increasing challenge made the hunt for better gear all the more necessary. When I felt like simply cruising around on my Sparrow and, essentially, goofing off, I headed to the Patrol missions. The Patrol missions dropped me into the planet of my choosing and said, “Go, explore and have fun.” There are missions to find that have you kill "X" amount of enemies, collect certain items off dead enemies, scout locations, and scan environments with your ghost. These mini-missions, as I have dubbed them, offered me something to achieve as I explored. The mini-missions rewarded me with Glimmer, experience, and points that go towards my Faction. While in Patrol mode I went hunting for Golden Chests -- there are five per map -- and just simply fighting enemies. I would try out new skill combinations, new weapons, and new gear. The world is quite large and exploring all the hidden rooms and areas not explored in the story was a lot of fun. While doing Patrol I was also leveling guns, armor, and skills, so it never felt like a waste of time and was a nice relaxing frolic through the different planets. The Patrols also seemed to drop a good amount of Engrams to take back to the Tower to be decoded and after level 20 the game is all about finding new gear. The game does not stop at level 20 and, really, this is where the game begins. Regular experience will get you to level 20 and I achieved that milestone around 16-20 hours into the game. Once you reach level 20 the way to continue leveling is by finding armor with Light. This Light is what levels you past 20 and it also places a lot more weight onto armor drops. This can be frustrating because the drop system is completely random and more than once I found myself decoding a Legendary Engram only to receive a piece of armor much weaker than what I already had. It can be frustrating, but it never halted my progress, for long. As of writing this my Hunter is level 25, almost 26, and he looks awesome. The Factions, mentioned earlier, also come into play during end-game and leveling up the factions is as easy as wearing a Class-item on my character. One character can play as all three factions, not simultaneously, but since each faction offers different gear, it could be worthwhile. I, personally, will be doing a different faction with each of my characters, but that is just my preference. While wearing the class-item for Dead Orbit, my Hunter's faction, I gained experience for the Dead Orbit faction instead of those points going into the Vanguard level. Each faction offers armor, weapons, emblems, and class-items specific for that faction and each faction has their own color scheme. I went with Dead Orbit because I liked the modifiers on the armor that they were offering, as well as, the fact that the armor is all Legendary and I needed that Legendary gear to boost my Light level. Each Faction and the Vanguard all have Legendary gear that you can attain through playing the game. The fun of the end game is the freedom to do what I want, whether it be Strike Play lists or Crucible, I was always earning something for my character. On September 16, 2014 the first Raid becomes available and my character will be level 26, or higher, with some awesome weapons and armor. Bungie says the Raid will greatly challenge a team of six Guardians, but the rewards will be worth the struggle. I cannot wait to test my skills against what the Raid has to offer. 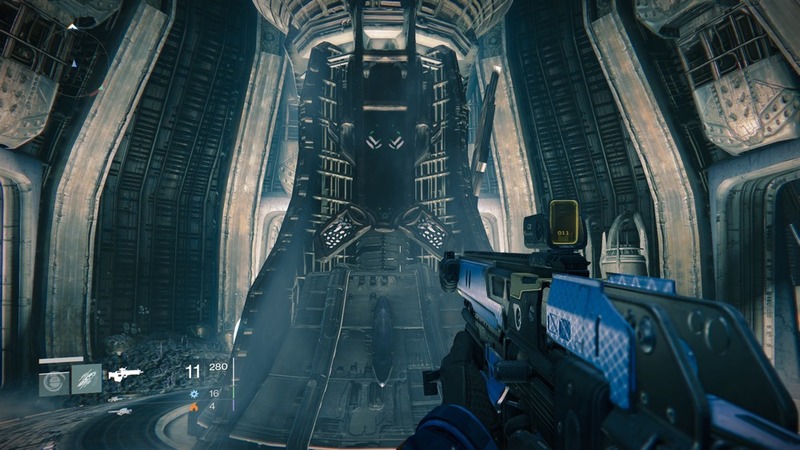 You can read more about the Vault of Glass Raid opinions after the review. Destiny is a huge game. I have spent more time than I will admit playing these past four days and I have barely scratched the surface. All three characters offer something different, so I will be playing through the game with all three. The game play mechanics are some of the best around and the variation of things to do in-game offers many ways to play the day away. The redundancy of mission objectives can become comedic at times, but the variation of enemies and environments makes that repetition feel less oppressive. The story is intriguing and I am curious as to what Bungie will be doing with their two announced expansions. The End Game content was frustrating at times due to the randomization of drops and many times my hopes were raised while I picked up a Rare or Legendary Engram only to be rewarded with, essentially, nothing. On the other hand, this just made me want to play more so that I could get those Faction points or Vanguard points to get better armor, or, do more Patrols to find better gear. There is always something to do in Destiny and if you are a fan of the FPS genre this game is a must buy. On Tuesday, September 16th, Bungie opened The Vault of Glass to the millions of Destiny players. I took my level 26 Hunter into the Vault and after almost five hours of intense fighting I sulked back into the Patrol and Strike modes to find better gear for my character; I need Legendary boots and two more Legendary weapons and being level 27 or 28 would also aid in this challenge. The Vault of Glass Raid is no joke. It is not for the casual Destiny player. It requires teamwork on a scale that most casual FPS players are not accustomed to. I recommend the buddy system. However, I do not see this challenge as a negative and Bungie has stated multiple times that it would be extremely challenging, so, in turn, they have delivered on that promise. The talk surrounding this event grabbed my interest from the first mention of it many months ago; when it opened I was there. I joined up with five friends that I have been playing Destiny with since the Beta and we headed to Venus, where the Vault is located. Once the Raid started there were no directions, no mission markers, and no objectives. Guardians must figure out how to succeed on their own. The loot drops were still random, but I did end up obtaining, without beating it, five Ascendant Shards, which will help me level my Legendary and Exotic armor. That being said, I do not know what the loot drops will be if and when I finish The Vault of Glass, but I am excited to see what the rewards wait for me. That is, if I can make it to the end. It took my team of six over an hour just to open the door to get inside the Vault. I cannot stress the necessity for teamwork and communication throughout. Also, having two of each class is a good plan since each class brings much needed skill sets to the mission. Figuring out what was needed to be done was not that hard, but attention must be paid to details and patterns of enemies and their weaknesses while trying to fend off hoards of Vex. It was quite tricky at times, but none of the challenges were unbeatable. My team arrived at the first boss and spent three or more hours trying to figure it out. Luckily, there are checkpoints throughout the fight, so, that when we reached a milestone we were not excessively punished by being removed from the Vault or something of that nature. I will go back to the Vault soon, but for now I am going to be searching and hoping for better gear. Good luck Guardians.